In an estuary with a bed of sand or gravel, the main channel usually bends (meanders) from side to side. The fastest current and the deepest water are at the outside of each bend. You can sneak upstream against the current by going round the inside of the bend. Here's a bit of shallow water physics. The faster you go, the more the back of your kayak is sucked downwards. It's more effective to go more slowly or move out to deeper water. Another illustration courtesy of Alan Byde. See Kayaking On Fast-Moving Water. If a strong current is in conflict with wind or waves going the other way it often creates rough conditions. See Wind-Against-Tide Conditions and Swell-Against-Current Conditions. Things can also get rough if a strong current is constrained by shallow water or a headland. See Overfalls & Tide Races, below. You can find tidal horrors in parts of the world with a large tidal range (12 feet or more) and where local geography constricts tidal streams so they speed up. We can't resist listing some. We expect you can safely kayak past all them at slack water on neap tides, but please make enquiries locally first! In British Columbia tidal streams often reach 13 knots in the Seymour Narrows on the eastern side of Vancouver Island. That is extreme, but they are reported to reach 17 knots in the Nakwakto Rapids at the end of Slingsby Channel, near Cape Caution. Over on the east coast the world-beating tidal range in the Bay of Fundy also creates some exciting sea conditions as an estimated hundred billion tons of water drains out in six hours, exposing huge areas of mud at low tide. The tides stir up nutrients and oxygenate the cool water, making it very rich in marine life including finback whales attracted by large schools of fish. Expect to encounter overfalls, tide rips, and tidal bores in the estuaries of several rivers. The rising tide causes reversing falls at St John, New Brunswick (plenty of good kayaking round there) in the narrow gap between the outer harbor and an inner basin. On both the ebb and the flood there is a difference in level of six feet or more. Fisheries & Oceans Canada says "twice during each tidal cycle, when the water levels inside and out are the same, the water in the gorge is placid and navigable. The surface of the water in the gorge near the peak flows is violently agitated and the velocity of flow is too rapid and turbulent to permit navigation". The USA has its share of overfalls and tide rips at exposed headlands. For example at some times, the current in some places at the entrance to the Strait of Juan de Fuca can exceed 6 knots, causing dangerous tide rips to appear off Cape Flattery, Race Rocks, Dungeness Spit and Point Wilson. There is also major turbulence in some river mouths, but a generally small or very small tidal range means few really extreme currents. On the east coast, Cobscook Bay near the Canadian border has an average tidal range in the region of 20 feet, resulting in very fast currents in narrow channels. The US Pilot Guide comments "the deepest draft using Cobscook Bay is 14 feet. Strangers seldom enter. Local knowledge is recommended... Cobscook Falls [at Mahar Point] are reversing falls.... tidal currents follow the general direction of the channels, but in the coves there are strong reverse eddy currents, and heavy overfalls form over the submerged rocks and ledges. The velocity is estimated at 5 to 8 knots and some of the buoys are towed under when the currents are at strength". The Old Sow whirlpool is not far away. The world record for a current in the sea is held by the Saltstraumen near Bodø, in Norway. As the Skerstadfjord fills and empties, the water has to get through a gap about 150 yards wide. The average speed of the water is 7-9 knots. It has been estimated that peak flow is 20 knots and this creates colossal whirlpools. See Large Back Eddies & Whirlpools, below. 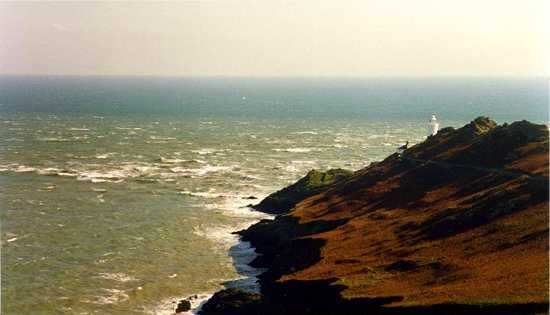 Off the Cotentin peninsula in northern France and round the island of Alderney is an area of fast currents known in English as the Swinge and the Race and in French as the raz Blanchard. See the current atlas sample page. Alderney is one of the Channel Islands or îles anglo-normandes. Boaters in the inter-island channels may suddenly notice a lighthouse or small island apparently charging straight towards them, making a wake like a supertanker in a hurry. Tidal streams can reach 13 knots and there can be dangerous overfalls, especially when a strong wind blows against the tide. The Channel Islands are a great area for sea kayaking. Even the waters round Alderney are calm at slack water, and a popular destination for yachtsmen. From a sea kayaker's point of view, the distance to safety is never very great but you do need a good understanding of tide tables, charts and the current atlas. The coast of Britain is mostly quite exposed to the open sea and it has strong tides driven by a large tidal range. Even so, 99% of it is safe for intermediate kayakers on a nice day. Apart from the Alderney race, Britain's tidal stream record-holder is the Pentland Firth off the north coast of Scotland, where the flood tide going from the Atlantic to the North Sea pours through the gap between Scotland and the isles of Orkney. You can have a nice kayak trip in the Firth when the weather and tides are right, but beware the effect of wind against tide, and the navigator with shaky arithmetic. Local currents can reach 10 knots and they create dangerous conditions when the tidal stream conflicts with strong winds. This area is very exposed to north Atlantic gales which have been known to lift stones from the cliffs at Dunnet Head and send them crashing through the windows of the lighthouse, 345 feet above sea level. In the words of the North Sea Pilot for 1875 "the hatches of small vessels ought to be secured even in the finest weather" before they enter the Firth "as... the transition from smooth water to a broken sea is so sudden that no time is given for making arrangements". The worst spots in the Firth have colorful names. At the Bore of Duncansby and the Merry Men of May, the 1875 Pilot said that with some combinations of tide, wind and waves, "a sea is raised which cannot be imagined by those who have never experienced it". In areas with a big tidal range such as British Columbia, Maine and northwest Europe, most coastal currents are created by the rise and fall of the tide and many of them flow in alternating directions (reversing currents). Most of North America and the rest of the world has a small or very small tidal range so other factors become more important. Many major currents are caused by steady global winds and convection where cold water descends into the abyssal depths. Flowing continuously, they make up a heat balance system called the global conveyor. Click here for a diagram of its effect on North American waters. For example the Gulf Stream flows northwards along the eastern seaboard, not far offshore, 100 miles wide and with a speed of nearly 3 knots. This early chart was Benjamin Franklin's attempt to explain to ship's captains how they could reduce the time of a round trip from Britain to America. Tidal streams dominate the last few miles of most rivers, especially in low-lying areas. In an estuary, the normal direction of flow of the river will be reversed by the incoming tide. See Tides & Rivers. At a surf beach there are very often longshore currents, flowing sideways along the beach in shallow water at walking pace. The reason is that a breaking wave consists of a lot of water rushing up the beach, and that water has to get back out to sea somehow. It goes sideways until it can go no further, and then it flows back out to sea in a narrow, intense "rip current" like a river. A rip current is often a good way for a sea kayaker to get through the surf line, seawards or back to the beach, without getting wet. A wind which blows continuously for several days over open water will create a surface current of up to 2% the speed of the wind. So a Force 5 wind may create a surface current of up to 0.42 knots. 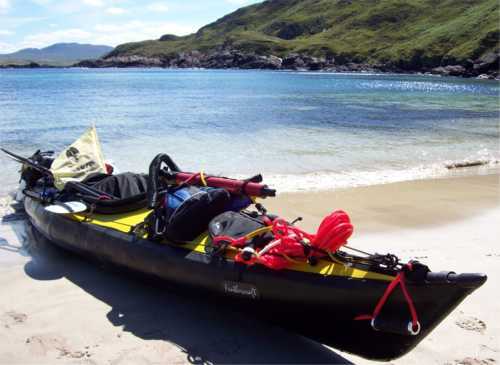 To a sea kayaker, this is overshadowed by the direct effect of the wind on a lightweight boat. If a fast current is constricted by a headland jutting out into the sea, or a channel between an island and the mainland, or it flows over an undersea reef, bar across a river mouth or rocky sill across the mouth of a fjord, it can behave just like a whitewater river. Expect tide races, which are often fun; tide rips which may be fun; and possibly overfalls. But don't worry. Tide rips and overfalls are usually marked on charts, especially those on 1:25,000 scale. The symbol is two or four horizontal wiggly lines, one above the other. Bad ones would get a mention in the pilot guide for the area and are unlikely to reach any great size except in storm conditions. If you cross the area at slack water, which is the time when local tidal streams have stopped flowing one way and have not yet started flowing the other way, the water should be calm. You can find the time of slack water with a set of tide tables and a current atlas. If you want to be particularly careful, time your trip for neap tides as well. If you failed to buy a chart or pilot book, or ask in the local bar, you should still not have any difficulty at all avoiding a tide race or overfall. If you find yourself being carried swiftly towards a large roaring area of exploding waves, it's a good moment to move sideways across the current so that you go round it rather than through it. Under certain conditions of wind, tide and swell, a tidal stream pouring over a rock ledge will generate breaking waves. The same may happen where a tidal stream pours through any shallow part of the sea or over deeper currents moving at a different speed. These areas are known as overfalls. Sea kayakers quite often use this word when referring to cuddly little standing waves that your grandmother would enjoy surfing. When other seafarers use the word they mean something quite nasty, and certainly the overfalls on a chart are marked because they're a hazard to shipping. The International Hydrographic Organisation is responsible for consistent worldwide standards in nautical charting. Its Hydrographic Dictionary defines overfalls as "short, breaking waves occurring when a strong current passes over a shoal or other submarine obstruction or meets a contrary current or wind". 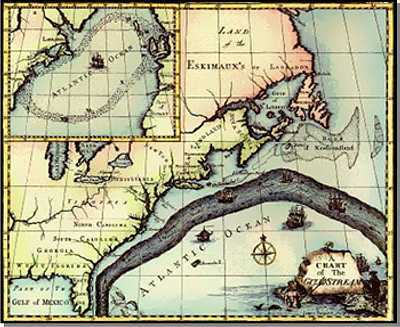 Bowditch's American Practical Navigator defines them as "breaking waves caused by the meeting of currents or by waves moving against the current". Their nature changes constantly with changes in the height of the tide, the speed and direction of the tidal stream, the speed and direction of the wind, and the size of any swell. It is well worth going around overfalls, rather than through the middle, and some can be just terrifying at peak flow. There are plenty amongst the little islands off the south-west tip of Wales that we use for a sample chart extract. For more information see Holes and Example Of A Hole. According to the Hydrographic Dictionary and Bowditch a tide race is simply "a strong tidal current or a channel in which such a current flows"..."a very rapid tidal current through a comparatively narrow channel". A tide rip consists of "waves formed on the surface of water by the meeting of opposing tidal currents or by a tidal current crossing an irregular bottom. Vertical oscillation, rather than progressive waves, is characteristic of tide rips"... "agitation of water caused by the meeting of currents or by a rapid current setting over an irregular bottom". Not to be confused with a rip current at a surf beach. When water pours through a narrow channel , round a headland or over a shallow ledge of rock, it may create a tide race. On a calm, sunny day that often means an attractive procession of smooth stationary waves. Small and medium-size wavetrains are perfect for practicing surf technique. See Standing Waves. In any case, a kayaker can usually get past a tide race on the inside by staying very close to land. Any tide race can be deeply unfriendly in strong winds or with a big swell running. It may become an area of fast turbulent water with confused breaking waves. Significant tide races are not all that common even in areas with a very large tidal range. Most are off rocky coasts with headlands reaching out into the ocean. Elsewhere we list some and discuss what makes a friendly wavetrain, and what makes an unfriendly one. Big tide races may flow faster than a kayak can sprint. On a calm sunny day, kayakers struggling to round Lands End against the current look like tiny dots of color against black water, and often disappear behind huge oily waves. Memorable but not recommended. A tide race is not usually dangerous but in windy conditions its standing waves can steepen and break colossally. A really big tide race may, at peak flow, always have breaking waves which could keep you underwater for long enough to make you give up sea kayaking. During spring tides in southern England there is often a large roaring area of exploding waves at Start Point in Devon and Portland Bill in Dorset. It takes only a 4 knot current and some wind to create a heavy tide race at Start Point. The photo above shows it on a windy day, at peak flow on spring tides. See the lighthouse? The largest breaking waves are more than 8 feet high. The tiny white dot in the center background is the sail of a yacht taking the long way round. At slack water this area is often a calm and lovely vista of clear green-blue water. Currents in the sea flow like a river but on a larger scale, so small reverse eddies form downtide of rocks, man-made objects such as buoys and bridge columns, and any other obstructions. Large eddies form downtide of islands and headlands. Click to go to two diagrams. Usually, back eddies spin lazily so that the water on one side flows with the tide, the center rotates on the spot, and the water on the other side flows in the opposite direction to the tide. This provides the experienced sea kayaker with a way to travel against an adverse current, by going from eddy to eddy. In the few areas of the world which have unusually strong tides, eddies may form alarming swirls and boils on the surface of the sea. For example amongst the islands and channels of the Bay of Fundy. If an area of eddies is a threat to larger boats or may affect the navigation of ships it will be marked on a nautical chart by little spirals. Where there is a particularly strong local current flowing past an island or headland it may create a whirlpool. A whirlpool is a large, powerful eddy, the center of which is noticeably lower than sea level. Visit the site of a whirlpool at a period of neap tides, or at slack water when the current is about to change direction, and you will see calm water. Visit at spring tides and maximum flow and you will see and hear violent white water. Whirlpools are seldom any real threat as the large ones are so obviously dangerous that you will stop some distance away, but they can still become legendary. The world record for a current in the sea is held by the Saltstraumen near Bodø, in Norway. As the Skerstadfjord fills and empties, the tidal stream has to squeeze through a channel about 150 yards wide. The average top speed of the water is 7-9 knots. It has been estimated that peak flow is 20 knots. This generates a series of whirlpools 30-45 feet across and apparently up to 18 feet deep. These can be viewed from 130 feet above by stopping on the Riksvei 17 highway bridge. The largest tidal whirlpool in North America is the Old Sow, off Deer Island in the Bay of Fundy. A suitable feature of the area with the world's largest tidal range. The only kayaking incident we've heard of involved a couple who went too close so the wife had to be towed back out by a motorboat. All the US Coastal Pilot has to say about it is "whirlpools and eddies which are dangerous to open boats...during spring tides the flood attains a velocity of about 6 to 7 knots". In Britain, the Hag of Corryvreckan or Corrievreachan (Coire Bhreacain in Gaelic) has a certain reputation. It forms at certain times in a narrow channel between the islands of Jura and Scarba, in Scotland. The Hag can sometimes be heard roaring from a distance of 7 miles, and it's said to be able to swallow a fishing boat and spit out matchsticks. It's a spectacular piece of water at some states of the tide, and very dangerous for boats the size of a kayak. It's generally possible to go past on the other side of the channel, and at slack water on a neap tide people have even swum through the Hag from the adjoining beach. 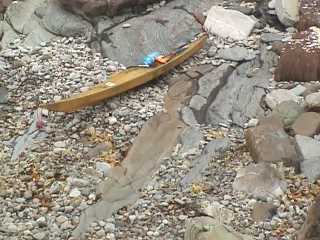 Here's a kayak on that beach - at slack water. There are a few, a very few powerful little whirlpools which are so compact that they are unlikely to affect anything larger than a kayak and are therefore not marked on the chart. For example at the Falls of Lora on the west coast of Scotland. See Standing Waves. We know of only one really dangerous little whirlpool. It is downtide of Horse Rock, Pembrokeshire, and lies on a direct route from the B-tches to the beach at the St Davids lifeboat station, St Justinian. When tidal conditions are just right, even when the waters flowing through Ramsey Sound are generally smooth, Horse Rock is usually underwater. It can create potent whirlpools which can make just one of a group of kayakers disappear completely for five seconds. Some unlucky folk have stayed down a lot longer than five seconds, and this area is now described by the Welsh Canoe Association as a "no go" zone. Horse Rock appears on the chart extract we use in the chapter on sea kayak navigation. It is between the northern half of Ramsey Island and the mainland, just next to the deep water channel. It is shown as a small round object which is stated to be 0.9 meters above the level of the lowest tides. Note that immediately alongside it is the symbol for a wreck with masts visible at low water.